Beautiful property for sale, consisting of the original farmhouse (built c1800), three quality letting gites, swimming pool with toddler pool and waterfall, and five hectares (twelve acres) of land. Peaceful and secluded position with views across and down a valley, yet only five minutes away from villages with shops. Our home is in the lovely farmhouse which has been lovingly restored yet still retains character from yesteryear: beams, stone walls, stone sink and a 14th-century stone arch which we were told came from the local abbey after it was demolished in the late 18th century. Our own piece of history. We have a mixture of garden, field and woodland, with a variety of fruit trees (apple, cherry, fig, plum, apricot, mulberry and walnut). Some areas of the garden have abundant wild tulips and daffodils, and the fields have several varieties of wild orchids, mixed in with the carpets of wild flowers in the early summer. 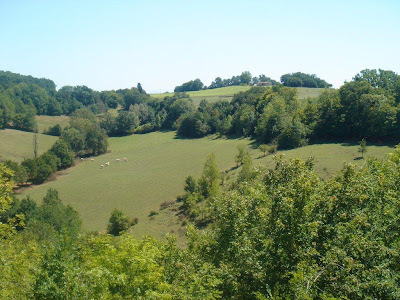 The property is 30 minutes to the east of Agen, in the Lot et Garonne Department of S W France, known for its quaint bastide villages, rolling hills, and a wonderful climate with long hot summers. We have succesfully built our gite business over the last nineteen years and have a high proportion of returning guests. We have loved meeting people from all over the world, from all walks of life, and have made so many new friends. We will be sad to leave this idyllic spot, but advancing years mean we would like to step back from the business and enjoy retirement, albeit still in this lovely area. The three gites are to be sold furnished and equipped, ready for rental. Main house to be sold unfurnished, although furnished could be possible.